An equinox occurs twice a year, around 20 March and 22 September. The word itself has several related definitions. The oldest meaning is the day when daytime and night are of approximately equal duration. The word equinox comes from this definition, derived from the Latin aequus (equal) and nox (night). The equinox is not exactly the same as the day when period of daytime and night are of equal length for two reasons. Firstly, sunrise, which begins daytime, occurs when the top of the Sun‘s disk rises above the eastern horizon. At that instant, the disk’s center is still below the horizon. Secondly, Earth’s atmosphere refractssunlight. As a result, an observer sees daylight before the first glimpse of the Sun’s disk above the horizon. To avoid this ambiguity, the word equilux is sometimes used to mean a day on which the periods of daylight and night are equal. [note 1]Times of sunset and sunrise vary with an observer’s location (longitude and latitude), so the dates when day and night are closest together in length depend on location. The other definitions are based on several related simultaneous astronomical events, and refer either to the events themselves or to the days on which they occur. These events are the reason that the period of daytime and night are approximately equal on the day of an equinox. An equinox occurs when the plane of Earth’s Equator passes the center of the Sun. At that instant, the tilt of Earth’s axis neitherinclines away from nor towards the Sun. The two annual equinoxes are the only times when the subsolar point—the place on Earth’s surface where the center of the Sun is exactly overhead—is on the Equator, and, consequently, the Sun is at zenith over the Equator. The subsolar point crosses the equator, moving northward at the March equinox and southward at the September equinox. 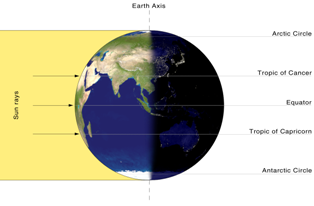 During an equinox, the Earth‘s North and South poles are not tilted toward or away from the Sun, and the duration of daylight is theoretically the same at all points on Earth’s surface. At an equinox, the Sun is at one of the two opposite points on the celestial sphere where the celestial equator(i.e. declination 0) and ecliptic intersect. These points of intersection are called equinoctial points: classically, the vernal point (RA = 00h 00m 00s and longitude = 0°) and the autumnal point (RA = 12h 00m00s and longitude = 180°). The equinoxes are the only times when the solar terminator is perpendicular to the Equator. As a result, the northern and southern Hemispheres are illuminated equally.